If you’re looking for a flexible lighting fixture, then you might find swing arm lamps to be just what you need. These lamps are offered in variety of sizes and styles. Many people prefer installing swing arm lamps in specific areas of sitting rooms, reading rooms, bedrooms, dens and relaxation areas. The correct place to install the lamp will depend on the intended task. They provide antique lighting for home offices where the light can be aimed in multiple directions on a desk. Whether you are an artist, architect or student, there are times when you need additional lighting for your work. Today, they have been embraced by home cooks who mount them above the kitchen’s cookbook nook. This makes it easy to access recipes. Swing arm lamps feature an adjustable arm that allows you to change the distance between the wall and light. They can be installed near couches or beds as reading lights or unique points like above kitchen sinks for easier cooking operations. These lighting systems are versatile and be used for various tasks. Since they are adjustable, swing arm lamp lighting is very functional and you can extend them to allow for general lighting or pull them closer when you need task lighting. You can choose from a variety of styles including modern, traditional, transitional as well as different finishes including bronze, brass, nickel and others. Since most swing arm lamps are either mounted on the wall or placed on top of the desk, they do not usually take up any valuable space in your room. 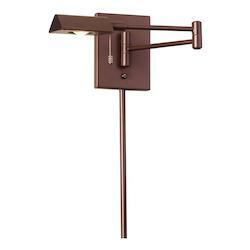 Swing arm wall lamps are not a new phenomenon in the lighting industry. However, they have been upgraded with new styling and functional features therefore leading to their popularity in the current market. Wall mounted swing lamps can be installed almost anywhere in your home. However, they are most commonly installed in bedroom. When mounted to the wall adjacent to the bed, they provide great reading light that you can easily turn off without stepping away from your bed. Apart from the bedroom, wall mounted swing lamps can also be installed in living rooms, dens and home offices. Installing swing arm wall lamp fixtures in your living room enables you to conserve on your space. They are available in various styling and designs and you can choose between traditional, contemporary and modern designs. Traditional swing arm wall lamps provide a warm, welcoming appearance while the clean and sleek contemporary designs add extra fashion to your room. Desktop swing lamps are flexible forms of lighting that provide extra light wherever it is needed. They are normally built with a balancing counter-weight at the end of the swing. This allows the arm of the lamp to be relatively longer for enhanced flexibility, enabling the lamp to move to all directions: left, right, down and up with relative ease. This design requires a heavy base and counter weight to keep the lamp from falling over. Swing arm floor lamps can be added anywhere that additional lighting is necessary. They are designed to provide sophisticated and sleek lighting for any room in your home. This gives you a flexible operating space for carrying out your tasks or reading. The adjustable arm featured on these swing arm lamps enables you to direct light where you need it. Swing arm floor lamps normally come in various designs including 3 arm swing arm floor lamps, 4 arm floor lamps, 5 arm floor lamps and more. What makes these lights popular among most homeowners is their excellent combination of adjustability and portability. They are designed in a perfectly proportional style, allowing you to easily reach them when seated at your chair or couch. We Got Lites offers traditional, streamlined and modern arm swing lamps. Before settling on your ultimate arm swing lamp fixture, there some things that need to be taken into consideration. First of all, you should identify the exact location where you need extra lighting. The next step is deciding on the task you intend to perform with the extra light. Wall mounted swing lamps are perfect for reading in your bedroom, though they are relatively expensive compared to traditional lamps. If you need more flexibility, then a standard wall mounted swing arm fixture may serve you better. For those who operate in a large workspace where more flexible lighting is required, a swing arm desktop lamp or stationary lamp fixture might be more suitable. When mounting swing arm lamp fixtures, you need to determine the right height when installing the lamp. If you install them too high, they are likely to cause glare, while those fixed too low produce too much light which can interfere with the effectiveness. The perfect way to find the optimal mounting height for swing arm lamp fixtures is by sitting up in your typical reading position from your bed or chair. To reduce shadows and ensure even illumination of the light produced, the swing arm should be placed just above the shoulder. These lights do not necessarily have to be on both sides of the bed to provide well-spread lighting. All you need is the perfect installation height. When mounted at the right height, swing arm lamps provide excellent flexibility when it comes to general task lighting. You can also use them for accent lighting for your existing home decor. We Got Lites offers a comprehensive and diverse collection of swing arm lamps. Our extensive selections of stylish and unique swing arm lamps are available in a variety of shade materials and colors, including metal, glass and fabric. Customers can choose from different styles such as traditional, contemporary and modern. When it comes to swing arm wall lamps, We Got Lites has it all. You do not need to strain on your eyes or reduce the outcome of your tasks due to insufficient lighting. Swing arm lamps will compliment your home styling and lighting. Our aim is to provide you with multifunctional and unique lamps for extra lighting in your home. For more lighting solutions, explore our wall fixtures and wall scones. To achieve a bold look, you can match and mix these lamps with other lighting in our collection.